with Venus Shrink A Pack you can wrap, heat seal, and shrink on the spot. Items can be grouped or mixed and matched with personalised labelling and advertising inserts. It has built-in sealing timer and requires no pre-heating: it is ready for use in 1 to 4 seconds. The Venus VH1250 Hot Air Shrink Gun, included, plugs directly into the sealing unit. 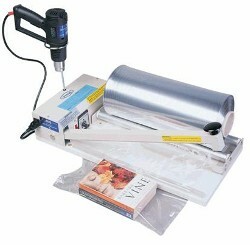 Use Venus LS44 centrefolded PVC shrink film (Not Included). Please contact us for our extensive range of L-bar Sealers, Shrink Tunnels, All-In-One Shrink Packaging System, Shrink Gun, Vacuum Packers and Skin Packaging to choose from the very best quality and lowest price.